A blend of botanicals transforms your favorite liquor into the storied "Green Fairy" of bohemian legend. You don't need a still or a garden of obscure botanicals to make your own fragrant absinthe with this DIY kit. Just add your favorite high proof neutral spirit--the kit has everything else to transform the liquor into the storied "Green Fairy" beloved of 19th century artists and writers (without the notorious neurotoxins of Bohemian legend). The key to the kit is a blend of eleven certified organic botanicals from around the world--including Fennel, Anise, Licorice, Hyssop, Angelica, and Artemisia--which add heady complexity to the brew. The kit also includes a 500 ml Tortuga antique green bottle with custom-designed label, a 4 inch funnel, a natural coffee filter, and easy instructions for brewing your absinthe. The label invites customization to record your cocktail creation. Assembled in Nevada by cocktail-loving couple Ryan and Melanie Belshee. Refill kits also available to keep the Green Fairy flowing. Absinthe Making Kit includes: spices and botanicals, instructions, 500 ML bottle, 1 4" stainless steel funnel, one natural filter. 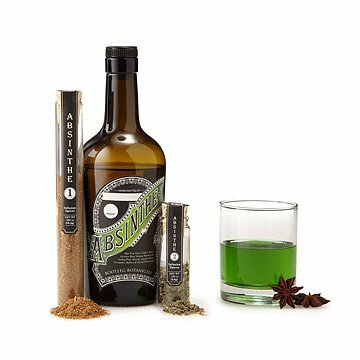 Absinthe Making Kit - Refill includes: spices and botanicals. Yields 500 ML of Absinthe. Estimated brew time: 26 hours. Got this for a friend for Christmas. They've been asking about refills and have been thanking me for the kit for a couple of months. I would try this again and also some of the other "kits"
Thought it would be fun for the daughter and son-in-law. Great gift for that connoisseur of cocktails in your life! Great product. Bought this for my brother for Christmas. Arrived quickly and just as pictured. He is a connoisseur of all things cocktail related and, well what do you get the person that has most everything in their bar set? Absinthe! He loved it and cannot wait to use it. Was really a unique gift and something you can't just pick up at your local mall. Haven't tried yet because it's a gift but I'm sure he'll enjoy creating his own Absinthe. This kit came in a great little box perfectly displayed. My husband loves absinthe & experimenting with drinks so I thought he would enjoy "making" his own. And he did! I would but again for sure! I cannot wait to give this unique gift at my close friends holiday party. Everyone is suppose to bring n alcohol themed gift over $25 for us to "fight"over. I have a feeling this one will be a hit. The kit is awesome! Purchased this as a gift for my daughter's boyfriend. He loves making craft brews and ciders. He loved this! Beautifuly packages and very easy to use.